JIM GULCZYNSKI, an owner of Pro Valor Charters, "sails" from West Allis, Wisconsin, USA to the BVI. He grew up speed skating and bike racing. He spent entire summers at a family cottage in northern Wisconsin (which his father proudly built for his 12 kids). After his position as the First Alternate on the 1976 US Olympic team, he decided to pursue other sports. He next chose bike racing and experienced quite a bit of success in that sport as well. He managed West Allis Bike Shop for 20 years before moving over to the Pettit National Ice Center in Milwaukee. The Pettit Center proved to be a comfortable "home" due to his lifetime of skating, and also his parents' involvement as part of the speedskating officials staff. His father was elected into the Officials Speedskating Hall of Fame. After 17 years in ice management and working for a non-profit facility, he chose to follow his true love in life ... sailing! Ice management taught him a great appreciation for refrigeration and he knows good ice too (though it melts too fast down here). He is skilled at engine repairs and knows a bit about electricity as well. He seems to dabble successfully with all kinds of repairs (a great skill in the charter boat industry). Jim runs most aspects of PVC and is found 90% of the time out on the dock ... or, but of course, on a boat. He defers to Egbert, his right hand man, on a regular basis. They are a great team! CECILIA DONEGAN, an owner of Pro Valor Charters, and wife of Jim, grew up in West Allis, Wisconsin as well. She and Jim married in County Donegal, Ireland, in a small town called Carrick/Teelin on the North Atlantic. They said their "wee" vows in St. Columba's Chruch in Carrick, where Cecilia's great grandparents married, then later baptized and raised their children, before departing for a life in the US. It was a glorious wedding day for Jim and Cecilia for certain, with temps in the 70's (yes, in October in Ireland!) and they were privileged to see a rainbow on their way to church the morning of their marriage. Cecilia worked 20 years at Foley & Lardner law firm, the 2nd oldest law firm in the US, as a legal secretary (the majority of her years assisting a patent litigator). She returned to college at the age of 35 working full time at Foley while attending college full time as well. She proudly shares that she finished college with honors in four years! Just about that time, they moved onward to the BVI ... and here we are today! Her interests include volleyball (coaching and playing women's and co-ed), along with bike riding and spending time with her nieces and nephews. Her love of the color green leads most to understand why they chose to marry in IRELAND (and she chose to wear a GREEN wedding dress). If there is something missing from "'de islons" it's exposure to a greater range of sports and also spending time with family and life-long friends. She also spent many years decorating cakes both novelty for birthdays and also wedding cakes. To date she hasn't found the right recipe to continue that love in the islands as the temps don't allow the frosting recipe she used to hold in place. You see there are benefits to living in a colder climate (Wisconsin). Cecilia manages the administrative side of PVC and is found most often in the office (thus she doesn't have much of a tan to speak of) yet sports enough freckles for a "wee bit" of an Irish tan. While she loves to head out for a sail, she brings little mechanical knowledge to the business -- though she's learned a ton listening to the guys ... and charter guests too. Jim and Cecilia are both from large families in West Allis -- Jim-12 kids and Cecilia-10 kids. Thus, when vacation presents itself, they return home to connect with as many siblings as possible. And yes, they were both raised in Catholic families! 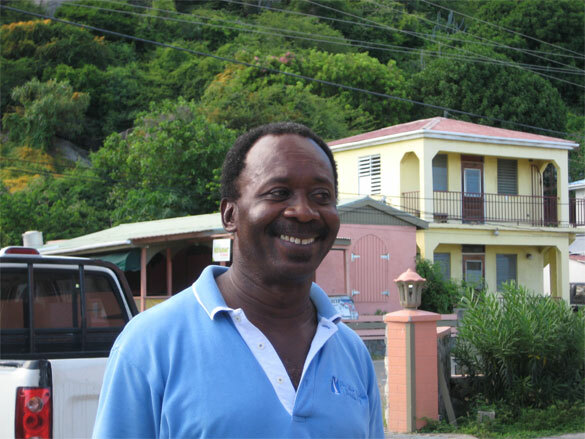 EGBERT CLARKE, from Guyana, joined PVC in December 2007. We are thrilled to have him as part of our gang. His skills are quite varied offering a strong electrical background. He and Jim are "a match made in Paradise." They certainly share maintenance ideas, repairs and "how tos" off of each other on a daily basis. Egbert has continued education all his life and you'll know that when you speak with him in person. We are fortunate to have enticed Egbert to come our way from Sunsail where he worked for 13 years managing the parts department. He is a true blessing to have with us at PVC -- we couldn't imagine working without him. MOHAN KARRAN, from Guyana like Egbert ... Keith is a dock assistant offering support to Egbert and Jim with just about anything you can imagine that regards boat maintenance or preparation for charter. He is a real gem to have in our company and we hope he continues learning more and more about the business as he clearly makes a difference in the experience each guest has while here on charter (whether the guests know that or not or even get to meet him). He can be found on and will do just about anything to support the whole of the charter ready processes. Starting with eight charter boats in 2005 and expanding to 18 for the 2015/2016 season, we have every reason to be proud owners of PVC. Our fleet is an ever-evolving aspect of the charter business as boats come and go and owners of the yachts follow their own sailing dreams. Watch our website for new additions to the PVC fleet. It seems we rarely are wanting for something to keep us busy as there is never a dull moment in the charter business. We enjoy welcoming guests from around the world! We promise to carry our Midwest Work Ethic into the business for years to come -- all in hopes of meeting your every charter need ... assuring you the SAILING VACATION OF A LIFETIME! Come down for a sail with us soon!